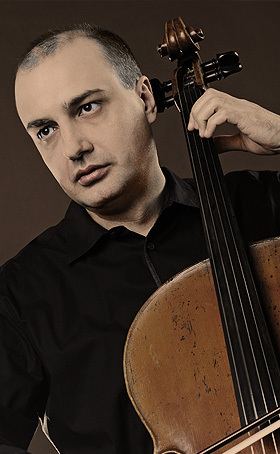 Denis Severin is a professor of cello at Geneva University of Music and Bern University of Arts (Switzerland), where he teaches cello as a major, baroque cello as a minor and chamber music. A coveted guest professor, he also gives master classes and leads orchestra projects at Centro superior de musical Katarina Gurska (Madrid, Spain), Jāzeps Vītols Academy of Music (Riga, Latvia), Central Conservatory of Music (Beijing, China), Franz Liszt Academy of Music (Budapest, Hungary) and National University of Arts (Kharkov, Ukraine); regularly gives summer master-classes in Germany, France, Poland, Russia, Georgia and Brazil. In 1996 Denis Severin graduated from Moscow State Tchaikovsky Conservatory, where he studied under professor Dmitry Miller. 1996-2003 continued his education under professor Daniel Grossgurin at Geneva University of Music professor Thomas Demenga at Music Academy of Basel and professor Christophe Coin at Schola Cantorum Basiliensis (Switzerland). He also attended master classes of professors as Janos Starker, Natalia Gutman, Antonio Meneses, Anner Bylsma, Truls Monk and Garry Hoffman. Denis Severin is a winner of Echo Klassik Prize (2015) and Grammy Awards (2007), and a laureate of several international competitions in Greece, Italy and Spain. Denis Severin serves as a jury member for a number of music competitions: International Chamber Music Competition (Illzach, France, March 2013), 7th International Tchaikovsky Competition for Young Musicians (Monteux, Switzerland, March 2012) and Young Swiss Musicians Competition. He is also president of an international charitable organization Art Without Borders and an organizing committee member of the European String Teachers Association (Switzerland). He performs as a soloist and a chamber musician in some of the most prestigious concert halls around the world, among which are Queen Elizabeth Hall (London, England), Concertgebouw (Amsterdam, Netherlands), Musikverein Wien (Austria), Konzerthaus Berlin (Germany), Philharmonic Society Concert Hall (Prague, Czech Republic), Cité de la Musique and Radio France Concert Hall (Paris, France), Victoria Hall (Geneva), Tonhalle Zurich (Switzerland), Lutoslawski Concert Hall (Warsaw, Poland) and many others. D.Severin collaborates with some of the most distinguished ensembles and musicians. He is a frequent guest artist at classical music festivals in Germany, Austria, France, Spain, Belgium, Poland, Turkey, Singapore, China and Brazil.